Pasadena, CA–Carnegie’s Eduardo Bañados led a team that found a quasar with the brightest radio emission ever observed in the early universe, due to it spewing out a jet of extremely fast-moving material. 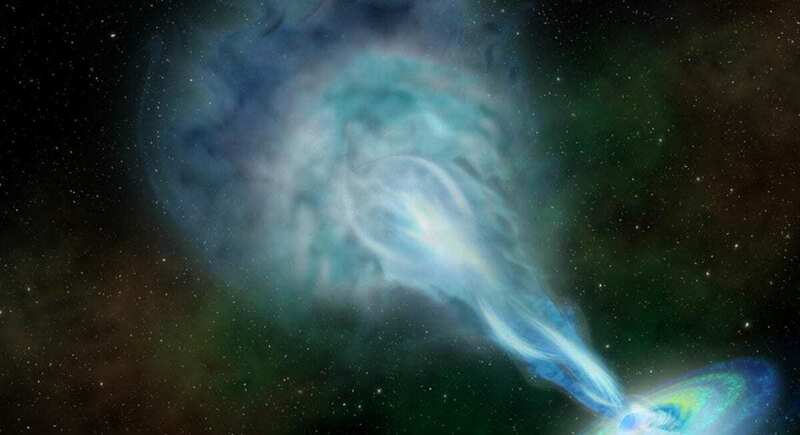 Bañados’ discovery was followed up by Emmanuel Momjian of the National Radio Astronomy Observatory, which allowed the team to see with unprecedented detail the jet shooting out of a quasar that formed within the universe’s first billion years of existence. The findings, published in two papers in The Astrophysical Journal, will allow astronomers to better probe the universe’s youth during an important period of transition to its current state. Quasars are comprised of enormous black holes accreting matter at the centers of massive galaxies. This newly discovered quasar, called PSO J352.4034-15.3373, is one of a rare breed that doesn’t just swallow matter into the black hole but also emits a jet of plasma traveling at speeds approaching that of light. This jet makes it extremely bright in the frequencies detected by radio telescopes. Although quasars were identified more than 50 years ago by their strong radio emissions, now we know that only about 10 percent of them are strong radio emitters. What’s more, this newly discovered quasar’s light has been traveling nearly 13 billion of the universe’s 13.7 billion years to reach us here in Earth. P352-15 is the first quasar with clear evidence of radio jets seen within the first billion years of the universe’s history. “There is a dearth of known strong radio emitters from the universe’s youth and this is the brightest radio quasar at that epoch by an order of magnitude,” Bañados said. “This is the most-detailed image yet of such a bright galaxy at this great distance,” Momjian added. It’s highly unusual to find radio jet-emitting quasars such as this one from the period just after the universe’s lights came back on. “The jet from this quasar could serve as an important calibration tool to help future projects penetrate the dark ages and perhaps reveal how the earliest galaxies came into being,” Bañados concluded.